This nice spacious condo has one bedroom. The recently renovated space is inviting and provides everything you need to feel right at home during your mountain stay. 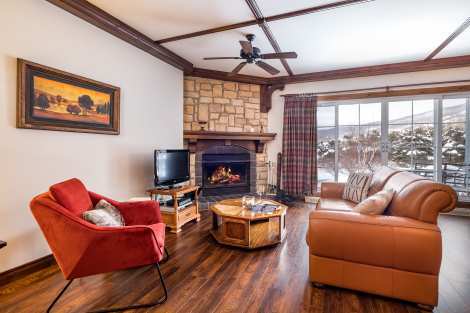 The living room has a gorgeous stone-covered wood-burning fireplace and a flat-screen TV with a DVD player. The large French door brightens up the main room and opens onto a patio in a natural setting. The well-equipped kitchen opens onto the dining room. The bedroom is very quiet and pleasant, and comes with a king-size bed, cable TV and dressers. The bathroom is equipped with a whirlpool bath. Heated tile floors add to your comfort. Amenities include wireless access to high-speed internet and a compact sound system.